Immediate Clinic Burien Occupational Medicine and Rehabilitation Clinic, Burien (Occ Med) is an urgent care center and medical clinic located at 15500 1st Ave S, Suite 106 in Burien, WA. They are open today from 8:00am to 4:30pm, helping you get immediate care. 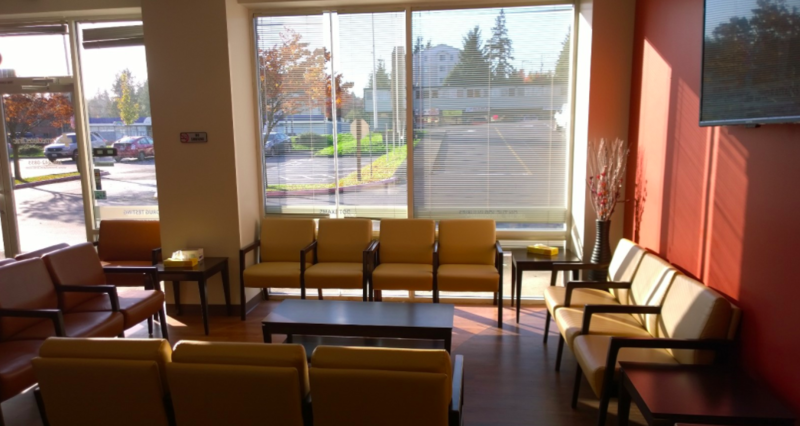 While Immediate Clinic Burien Occupational Medicine and Rehabilitation Clinic, Burien (Occ Med) is a walk-in clinic that is open late and after hours, patients can also conveniently book online using Solv. This location is rated 4.6 stars by patients . They also offer immunizations, physicals, tests, and other services on-site. Learn more about urgent care in Seattle. Patients typically pay between $19 - $125 for common services and Immediate Clinic Burien Occupational Medicine and Rehabilitation Clinic accepts insurances including Self-Pay, Medicaid, Medicare, TRICARE, and PPO. Cash payments are accepted and typical prices are $125 Base Price, $33 Flu Shot, $60 School Sports Physical, and $19 TB Test. The base price for an office visit at Immediate Clinic Burien Occupational Medicine and Rehabilitation Clinic is $175 with additional services being an extra charge. Patients typically pay between $33 - $175 for common services. Immediate Clinic Burien Occupational Medicine and Rehabilitation Clinic accepts many major insurance plans and multiple forms of payment, making it easier to get the affordable care you need. It is always a good idea to contact your insurance company before your visit to ensure the Clinic is in network for the service(s) you're seeking. From start to finish the whole staff has been an amazing part of my recovery! I couldn’t have done it without them!! Everyone one was professional and friendly; I would definitely recommend to my coworkers to get their CDL physical there. Great experience getting my DOT physical. I just wish the other Immediate care centers would have sent me to the occupational one first off instead of guessing which clinic had a DOT doctor. A bit of wasted time making appointments at the wrong clinic. Facility was modern and clean, I felt that my exam for a work injury was very thorough, and that the DR and staff were very competent and friendly. Everyone at the Immediate Clinc were very attentive and amazing during my visit. The staff was extremely passionate, friendly, and professional..
My experience from Melanie (spelling sorry) at the front desk to super nurse Claudia, to X-ray tech Darius to the most kind, empathetic , intelligent ,funny ARNP Anna was amazing! I was hesitant and did not want to go to get checked out after a work injury but was so glad I did! I was taken care of in a very wonderful and caring environment! I’d say this clinic is the best kept secret in Burien but so very glad I found it ! Keep up your amazing work! Thank you again! Everyone I encountered was polite and respectful. Good service from all. Thank you! Everyone was very supportive with my healing and gave me encouragement when I needed it to go on. Great staff... the kind of people you want and need on your team to recover! First the person at the front desk was great and she saw I was in pain and tried to help, next the person who took my blood pressure was very sweet and came in with ice for my back and last the MD was great and most of all she listened to me . I have been in and out of hospitals for the last 6 month with cancer and it was great to have people care.